85% of the seismic energy exerted on a storage system during an earthquake." North East, PA - June 2008 - RIDG-U-RAK’s patented Seismic Base Isolation System was awarded first place honors for "Excellence for Innovation" in the earthquake mitigation category at the 2008 National Earthquake Conference. The Seismic Base Isolator is a product that attaches to the base of storage rack upright frames and is then anchored to the floor. During an earthquake, the base isolator absorbs much of the seismic energy before it gets to the rack structure itself. This results in a huge reduction (85%) in the seismic forces the rack structure must resist, which concludes in little to no rack damage or product shedding during even the most severe earthquakes. "From our testing we determined that our base isolation system can dissipate 85% of the seismic energy exerted on a storage rack system during an earthquake," said James Courtwright, RIDG-U-RAK’s Chief Project Engineer. Recognizing the need to develop a product that would reduce the risk of product loss, damage and personal injury around storage rack installations during seismic events, RIDG-U-RAK invested in a multi-year R&D project. Development of the RIDG-U-RAK Seismic Base Isolation System included more than 100 full scale triaxial shake table tests preformed at the Structural Engineering and Earthquake Simulation Laboratory located at the State University of New York at Buffalo. RIDG-U-RAK developed this system in accordance with performance levels outlined in FEMA 460 Seismic Considerations for Steel Racks Located in Areas Accessible to the Public. These guidelines are for facilities using steel rack systems in retail environments where public safety is a very real concern during a seismic event. 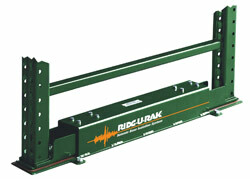 RIDG-U-RAK, a leading manufacturer of storage rack systems for distribution centers, industrial warehouses and retail shopping facilities, is a member of RMI, the Rack Manufacturers Institute, MHIA the Material Handling Institute of America and MHEDA the Material Handling Equipment Distributors Association. Customers include most large scale retail, home improvement, distribution centers and industrial warehouse operations.